Today we continue our firm profile series with an in-depth review of OC&C Strategy Consultants. Founded in London, and containing the spliced DNA of other major firms it acquired along the way, OC&C Strategy Consultants is a global player in today’s consulting industry. Known for its incredible family-style and entrepreneurial culture, relaxed work style, and long retention of employees, OC&C competes not only on the fact that it does purely strategy work, but also on its culture. OC&C was founded in 1987 in London by Chris Outram and Geoff Cullinan, who were both partners at the time with Booz Allen & Hamilton. This firm was birthed out of the frustration they both felt with their employer, who they believed devoted too much time to operational issues while neglecting strategic analysis. They decided it would be “more fun and more challenging” to start their own firm, and thus OC&C Strategy Consultants was born. Also in 1987, the German consultancy “S. & K. und Partner” was founded in Dusseldorf by Dr. Gerd Schnetkamp and Dr. Hans-Dieter Kleinhueckelskoten, who both worked at McKinsey. They decided to rebrand themselves and join the newly created OC&C firm. An office opened in Paris in 1989 and another opened in Rotterdam in 1992, founded respectively by Philippe Kaas and Pieter Witteveen, both previously Partners in the local McKinsey offices. Seeing an opportunity to gain greater access to the U.S. market, OC&C merged with the Callidon Group (based in Boston) in June 2007. Over recent years, the firm has successfully opened offices in India (New Delhi and Mumbai) and China (Shanghai and Hong Kong), displaying the forward thinking of OC&C Strategy’s management by jumping into the fastest growing markets in the world. Their gamble paid off handsomely – the majority of clients served by the OC&C Asian offices are leading multinational companies, board-level work, major private equity houses, and occasionally smaller companies. OC&C Strategy’s organization is fairly simple. The firm’s leader is “Worldwide Managing Partner” Chehab Wahby. The rest of the team is divided by region: USA, Benelux, Brazil, France, Germany, Greater China, India, Poland, Turkey, and the United Kingdom. Each region is managed by the group of Partners elected to represent it; local ownership means local accountability and autonomy. Depending on the size of the footprint in their region, the amount of managing partners directly correlate to sales. Like practice areas, OC&C Strategy Consultants has developed its strategy around smaller focus areas while promising big results. The firm professes the ability to better solve client issues due to its expertise . OC&C Strategy Consultants have 14 offices across 11 nations. They have a strong presence in Europe and are emerging in Asia and North America. 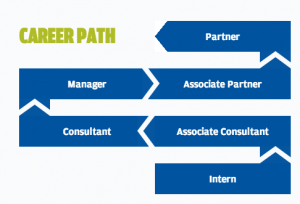 As an undergraduate, you’ll start off as an Associate Consultant. MBAs have the opportunity to enter as a Consultant. OC&C Strategy boasts about their atmosphere of meritocracy – where anyone has a shot of advancing up the ladder from Associate Consultant/Consultant to Partner (after fulfilling their roles as Manager and Associate Partner successfully). OC&C Strategy Consultants’ internships span anywhere from 8 to 12 weeks full time on a project. Expect to be given the same amount of work and responsibilities as an Associate Consultant. Your internship allows you access across all sectors; you could be working on an M&A project, developing corporate strategy or even being involved in planning major organisational change. The work you do throughout your internship will generally cover an analysis of the client, market data and modeling analyses. OC&C Strategy Consultants aim to train and give you a taste of what consultants do throughout your internship; therefore, this means that the projects you engage in will be fast-paced, intensive and brief. Make sure to think on your feet, as you will be rapidly gaining insights into a wide variety of challenges and business problems. Expect to travel to the client location on an as-needed basis; regardless, Fridays are usually spent in your home office. London is an exception; with many local clients, you will work even more from the local office. As always, you will be working in a team intensive environment, so be sure to network and collaborate as you will be meeting plenty of new people. As part of their cultural focus on fostering a sense of community and camaraderie, OC&C Strategy Consultants regularly organize office lunches, drinks and sporting events – so you have that to look forward to as an intern! A good number of OC&C Strategy Consultants go on to join the start up world. They either go on to develop their own start up or team up to help support one – dealing with operations, strategy and the whole gamut that comes with the territory. Others go on to complete their MBAs. It is important to note that OC&C is a great stepping stone firm to MBB; the skills and culture are similar, the work is high-profile, and the analytics are central. However, many employees are loyal to the culture of OC&C and just decide to stay – which bodes well for the future of the firm. OC&C Strategy receives rave reviews on their collegial environment. Looking for a more laid back, fun, collaborative environment with a start up feel? You’d love working at OC&C Strategy. Most people comment on the flat level structure of the organization where you can engage easily with anyone from intern to partner. In addition to that, a big bonus – depending on how you look at it, at least – is that you spend a lot more hours at your home office. Due to the strategic nature of their work, OC&C Strategy Consultants work more from their home office. However, operations projects are focused on the client’s site. In saying that, because OC&C is smaller than a lot of the other firms, you’ll have the opportunity to put your fingers in a lot of pies. You’ll get given more responsibility faster and engage in a lot of tasks ‘above your pay grade’ because it’s so small. Overall, you can expect to have great exposure to clients. It can’t be all good, can it? Hours is one thing – as any management consultant knows, hours are usually long and OC&C is not much different compared to the other firms. But here’s the biggie: if you are self motivated and love managing your own career path, you’d fit right in. However, if you are looking for more of a support structure with resources to back you up, OC&C Strategy is not the best place. Due to its young age, they have not fully developed a professional development programme for consultants and as such you will have to take personal ownership for your own growth. OC&C Strategy Consultants are impressive in the fact that they know what they are good at – simplifying and choosing a narrow focus that they are always able to over-deliver on. OC&C Strategy usually screens its applicants with either standard verbal reasoning and math skills SHL online tests (if your application is online) or two basic cases, fit questions and a 45 minute quant test to ascertain your math and critical thinking skills (campus recruitment). If you pass this first screening round, you are usually invited onsite for 2nd round interviews. This will usually be two back to back interviews with two different interviewers. You will encounter both fit and case questions during this round. More often that not, it could just be two 30 minute case questions. Contrary to many other firms, OC&C Strategy conduct their second and third rounds on the same day. After your 2nd round onsite, you will break for lunch. It is after this lunch break that the lucky 50% who made the cut will continue on to their 3rd round of their interview. In your third round, you will encounter two 45-minute case study interviews, this time with partners. These longer interviews are meant to enable you to delve deeper into strategy side of the cases. Be prepared: even though the firm has a cool-kid culture, interviewers are very smart and very experienced. Their questions can sometimes be intentionally brusque to determine the interviewee’s ability to handle stress. OC&C Strategy Consulting recruits from a significant number of top universities worldwide. Interestingly, the firm does not list its target schools online. Lucky for you, that’s why we’re here. In the USA, here are the schools OC&C recruits from. This is one area that OC&C Strategy Consulting drops the ball on. Due to their small size and the low amount of diversity within the firm, it hasn’t been a focus area. It is important to know that even though they do not actively pursue diversity, they are not actively against it either. It just isn’t on their radar as a focus at the moment.